Affordable Accoutrements: Tradition to Treasure! A Panacea? I've set a table for you before (HERE) that featured vintage Cape Cod glassware by Imperial Glass Company of Bellaire, Ohio. That post, "A Subtle Shine," featured vintage aluminum serving pieces and restaurant dinnerware. Today I thought I'd make Cape Cod crystal the primary focus of the table setting. "A piece of Cape Cod history was found in some old papers during the liquidation of Imperial Glass. It reads: 'The pattern (Cape Cod) was originated in Ireland by the Waterford Glass Company during the sixteenth century and was designed to go with Spode and Wedgwood earthenware patterns. Cape Cod Crystal was the first pattern made by the Sandwich Glass Comany of Cape Cod, Massachusetts. When Sandwich went out of business, Pairpoint Glass Company of New Bedford, Massachusetts, acquired all rights for hand-cut as well as pressed Cape Cod. They continued making only the hand-cut Cape Cod until 1926 when Pairpoint dropped the hand cut lines. In 1931, Imperial started production of Cape Cod Crystal. This pattern has been sold continuously for nearly 400 years.'" Imperial, which had previously been known for making utility glass, art glass, and colored glass (forerunner of what we now refer to as depression glass), was saved from its first bankruptcy when the president, Earl Newton, negotiated the sale to Quaker Oats (to be given as a premium in Mother's Oats) of five train carloads of Cape Cod glassware, packed in barrels. Not content, Newton then moved to capture a part of the high-end retail glass market. No longer restricted to the 'Five and Dime' ware, Imperial would attempt to compete head-on with the likes of Heisey, Cambridge, and Fostoria. 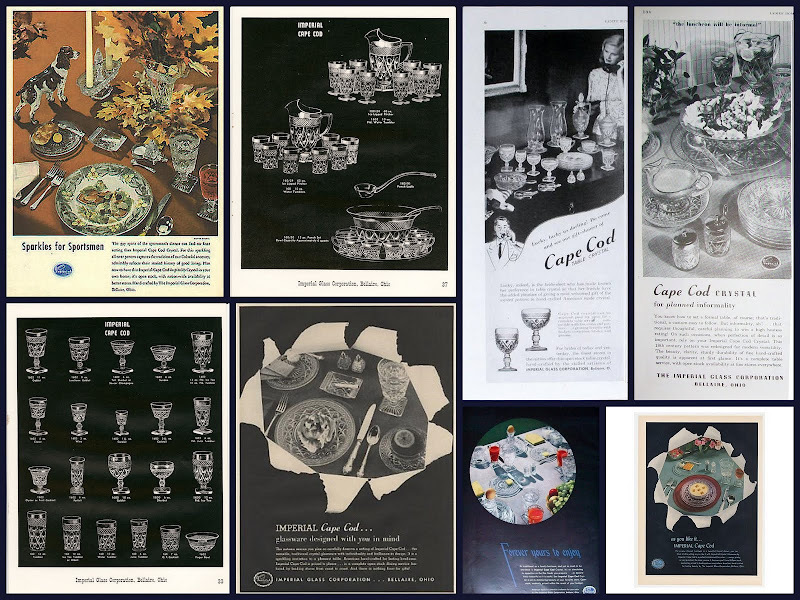 I created a collage for you (below) featuring Cape Cod ads and catalog pages from the 1940s, 50s, and 60s. It's easy to see how the pattern became so successful -- those creative advertising writers (mad men?) didn't hesitate to idealize their products. They'd use phrases such as: "Tradition to Treasure" ... "Aces With Men Too" ... "to men who might have a penchant for poker" ... "a panacea for coping with the day" ... "Pattern for Pleasure" ... "Every piece of Imperial's scintillating Cape Cod hand-crafted crystal is a gem!" ... "Cape cod Crystal for the gay, informal settings that somehow go with sunshine and a garden full of flowers" ... "pattern that adds to the blithe spirit of camaraderie wherever gather people of good taste" ... and (sounding very sexist in these days of political correctness), "Sportsman's Favorite -- Bringing home prize pieces of Imperial Cape Cod Crystal is as thrilling to a woman as the bagging of prize game to the sportsman!" We're in the sunroom on a beautiful afternoon. The garden's suffering from the heatwave we've been experiencing, but I managed to put together a centerpiece without going shopping. Believe me, it was a challenge! I found this pretty little marmalade container, with lid and underplate, in a consignment store in Nashville. I filled it with homemade pear preserves (from a tree in my father's orchard). I was thinking in terms of a Sunday brunch or a luncheon as I set the table. I used blue placemats (from Goodwill) and Enoch Wedgwood "Countryside" (1966-68) blue plates. I was inspired by the vintage ads to include tea in the pitcher (with a few lemon slices), wine in glasses, and a pat of butter on each bread plate. I opted not to follow the stylists' examples of providing cigarettes and individual ashtrays -- how times have changed! The sherbet glasses are perfect for appetizers, fruit courses, and desserts. These have the fancier stem (often called the miter, strawberry, or pineapple stem); pre-1943 Imperial catalogs offered a wafer stem. Therefore if you find Cape Cod stemware with simple wafer stems, it dates between 1932 and 1942. Imperial continued to produce Cape Cod until the company closed in 1983. Another view of the sherbet sitting in the center of a Cape Cod salad plate. Closer view of the flatware. I like the overall simplicity of the design. I realize we don't need to light candles this time of day ... but I had to show you these unusual candleholders. They weren't labeled Cape Cod when I spotted them at an antiques mall, so I suppose the dealer didn't know the pattern. The Garrison book states that they're "one of the most elegant of the Cape Cod candleholders and often overlooked as being the Cape Cod pattern." I think I'll name this bouquet "Slim Pickins'!" Sometimes it's fun to create a garden arrangement when none of the usual suspects (roses, hydrangeas, lilies, etc.) are at their best. I gathered hosta leaves and their sweet-smelling blossoms, liriope (turf lily/monkey grass) flower spikes, Japanese painted fern, crepe myrtles, and Rose of Sharon (Hibiscus syriacus) -- the result is below. As you'll see in the following photos, Cape Cod really comes to life as it responds to natural light. The little cruet below still has its original Imperial sticker. The pattern is distinguished by three characteristics: depressed circles (thumbprints), large depressed diamonds surrounding the thumbprints, and an outer band of small diamond points. The white cutwork napkins are from a recent estate sale. They were unused and very reasonably priced. I hadn't intended to upload so many photographs, but I loved the way the light was playing off the Cape Cod. To keep everything from being too "matchy matchy," I used a differently patterned butter spreader at each place setting. They're often available in dig boxes for $1 or less. Generally they're blackened with tarnish, but I enjoy the instant gratification of bringing them back to life with Wright's Silver Cream (now merged with Weiman Products). If you're interested in starting your own collection of Imperial Cape Cod glassware, beware of similar patterns you'll find at antiques shops and malls. There's "peanut butter glass" -- tumblers and sherbets made by Hazel Atlas. They have a vaguely similar look, but they're a simpler, lighter weight pattern, with less clarity and sparkle. It was the equivalent of jelly jar glasses, containing Big Top Peanut Butter (a Procter & Gamble product) in the 1950s. Cups, saucers, and plates were sold together in sets of four, probably as a sendaway premium item. Many people collect peanut butter glasses, and they certainly have their charm. It's just unfortunate that some antiques dealers, either unknowingly or unscrupulously, label them as being Cape Cod. Wexford by Anchor Hocking is another similar pattern, but it lacks the rounded indentations/thumbprints. It's a nice pattern, but a less expensive one, so be careful if you see Wexford mis-labeled as Cape Cod. Imperial promoted Cape Cod as a versatile pattern. One ad headline read "as you like it ... IMPERIAL Cape Cod" The text continued: "For a gay informal luncheon or a beautiful formal dinner, you can have a table setting as you like it with Cape Cod Crystal Glassware by Imperial. Cape Cod is a perfect complement for color -- always pretty, so very practical ... the more you use it, the more you'll love it ... moderately priced in leading stores everywhere. American handcrafted for lasting beauty by The Imperial Glass Corporation, Bellaire, Ohio." Let's see how versatile it is, OK? I think I'll change to a softer color palette for evening. Three changes: plates, Shelton by Haviland (1952-85); flatware, Gorham's La Scala; and peachy-pink placemats, Dollar Tree. I also added tealights in Cape Cod stemware, using sand to protect the glass from heat. Afterward, I poured out the sand and rinsed with cool water (using my fingers to make sure every trace of sand was gone prior to handwashing in warm, sudsy water). By the way, Cape Cod glasses are used on a daily basis in our household. They've survived hundreds of trips through the dishwasher unscathed (a sort of controlled experiment, since the ones at the back of the cabinets are rarely used). Whether frequently used or sitting idle -- they all look new and shiny! Having a solid dinner plate underneath makes it easier to appreciate the glassware's pattern. I almost forgot one other little change -- a silverplated water pitcher on the corner of the table. Are you a Cape Cod collector? Would you like to start a collection? Thank you to Artie of Color Outside the Lines. Artie was kind enough to direct his readers to tablescape posts by Susan, Julio, and me. You can see Artie's post HERE -- what excellent company: Susan and Julio -- two of my favorite people in the world! Artie mentioned my Etsy shop in his post, which reminded me that I needed to re-stock. I really forget about the shop, until I receive an e-mail saying there's been a purchase. I much prefer buying over selling, but it's time to add new items or "call it a day." So ... I'm adding a set of 8 iced beverage glasses and a set of 8 sherbets to the listings. I found them the other day at a local antiques mall at a good enough price that I wanted to pass the savings along to my readers. You can visit the shop HERE. Thank you to everyone who has stopped by, commented, and (best of all) made a purchase! Thank you, as always, to Susan of Between Naps on the Porch for making Tablescape Thursdays possible. Be sure to stop by and visit Susan and all her wonderfully talented tablescapers! How lovely and educational! I must examine my mother-in-laws pieces and with your post educate myself. Certainly understand about our garden flowers at this point and all the heat we have experienced. I think you did an exceptional job. Your photos are excellent as usual. Impressive collection, table setting, post, and photography. You got it all going on!!! A beautiful table as always. There is something timeless about a traditional table and you do it in spades! I always love your tables with flowers from your garden and candles and such elegant tableware from your colleciton. This is a great post and I like the vintage printouts you've shared. Bill, You are the master tablescaper. I know that I am in for a treat and an educational experience when I stop in to visit. Your cut crystal and glass is the prettiest collection I have ever seen! Beautifully paired with the blue placemat and dish. Such lovely attention to detail... down to the pear preserves! And I really noticed your beautiful table. The glass shows off the table surface so well. Just fabulous!!!!! The demure flatware is my very favorite. It is the perfect compliment to all the sparkle. And lastly, but not least at all, your photography in this post makes each image a little work of art. I always leave your site feeling so fulfilled and smiling! Bless you, my friend! I agree you are THE master at this! I love the Cape Cod! I have seen the Wexford around. What I really love is the square bottom. I'm seriously loving the Rogers Brothers flatware too. If I could put together a centerpiece like that with what was leftover in the garden, I would be jumping for joy. I am thinking of you for a table I'm attempting to do with Haviland "Forever Spring." A friend just brought me eight place settings to use, so I'll be looking back through your posts for inspiration!! Lovely Bill -- I love the way you tell us all about your tableware. The Cape Cod just sparkles so beautifully upon your table. don't apologize...you can't have too many photos. you continue to dazzle us. thank you. Bill, thank you for showing us how to show off the clear plates to the best. Both placesettings are gorgeous and it's obvious that you haven't spared one detail.. simply stunning. Bill, what a magical table with all the sparkling glassware...beautiful, beautiful, beautiful. Thanks for sharing all the information on Cape Cod vs Wexford. Am I correct in thinking CC has the square foot and Wexford the round? Bill, That is an elegant table! I love both settings but my favorites are the gorgeous Cape Cod Crystal (of course), the Enoch Wedgewood plates and the Gorham silver. It is so sparkly; you're right, it responds well as the light of day changes. Hope all is well with you. BEautiful settings. I like both, but would probably choose the second one for a more elegant feel. It reminds me of Sunday dinners when my grandparents ate with us. The good china and silver was always used. Makes me miss those days. Gorgeous settings! You are so right about Cape Cod, it is so very versatile! The crystal looks stunning in the candlelight with the soft peachy pink color palette and just as stunning in natural light with the other setting. The Garland pattern flatware is lovely too; what a shame whoever owned it never used it! Don't you DARE apologize for "too many photographs"...IMPOSSIBLE! We covet those shots, ya' know! It is spectacular the way you were able to capture the twinkling sunlight's shimmering sparkle on this beautiful pattern. I'm awe struck at the different ambiance created by just making a few subtle changes... switching the color of the placemat, going with the white china & of course, that very baronial silverware. Magnificent! Your table was a trip down memory lane. My mum did not have crystal - she had Cape Cod. She would make parfaits with the tall thin glasses. i wish I knew what happened to it all. Bill, your posts are always both educational and delightful to look at! I had never heard of the Cape Cod pattern, and now I "need" some. Gorgeous table -- love the sparkle in the candlelight, especially! And you must have some garden, to be able to pull off a stunning centerpiece with blooms in late August. What a beautiful table! No one does it grander than you, Bill! That is one fabulous collection! I gear you on the garden. Today we cut all the hydrangea down, and the only thing I have left blooming for cut flowers ...Black eyed Susan and some roses . Your bouquet looks lovely. I was wilting myself doing my little table out on the deck. It was HOT! OK so once again this is just stunning! I so look forward to you fabulous TT and it never fails to delight me! Oh Bill, Your talent is 'crystal clear'! My Mom loves Imperial Glass. She has a whole collection. I love this pattern. The first table is so simple, but the next is simply beautiful. I ran to my china cabinet thinking I have those sherbet glasses but, I do not :( I have to find out what they are because they aren't the Wexford, (although I do have 6 Wexford Tea glasses) and they aren't the peanut butter glass. I'm off to email replacements to see what I have in my cabinet. They had belonged to my Irish Granny and my boys referred to them as the "pudding glasses." Thank you for a well done, lovely, educational and beautiful post. I love all your things. As always ... a beautiful post! Thanks for all the info on Cape Cod ... I have tiny shrimp cocktails and a set of wine glasses in Cape Cod ... but I bought it to mix with something else! Your collection makes me want more! Thanks so much for sharing. This is so incredibly special... It has a casual and elegant feel, and sparks COMFORT! I LOVE the way it picks up light in it's multitude of facets... My favorite is the dimmed effect and how it sparkles... Love the little original sticker you left on. Ohio has given us SO many treasures from the past and this is truly one of them. thank you for sharing this beautiful presentation... OH I think your flowers are gorgeous!!! So beautiful, as usual. I especially love the candlelight table pic toward the end. That totally changes the ambiance. Oooohhh... so spakley! Very pretty! Such a beautiful setting. The glassware sparkles nicely. Wow. So elegant and lovely. Simply Beautiful! These pictures are all exquisite and creative and gorgeous and just beautiful. I love everything including the great info!!! Thank you for sharing your artistic eye, your lovely pieces, and your vast knowledge!!!!! Bill, Bill, Bill, this is the BEST one yet! LOVE how the light bounces off the pieces. You never cease to amaze me mister. Thanks for the great tutorial on Cape Cod glassware. I believe I will be able to identify it now. Both your tablescapes were beautiful! I never really thought of pressed glassware as being very formal, but you proved me wrong. I thought it was absolutely elegant with your Haviland! Gorgeous! I think this post was one of my favorite ones from you. Loved all the photos. Definitely not too many! Such beautiful glassware. It looks so glorious sparkling along your table. The pitcher looks like the crown jewel of your collection. Oh my goodness, I feel like I just entered the crystal palace!! So many wonderful pieces! So much sparkle! Love both sets of gorgeous flatware too! Note to self... Get some pretty new flatware! I just love it...and adore the ebay silverplate find. I am going to look around for that pattern myself. All the crystal... so, so pretty, especially in the candlelight. I especially love the marmalade jar! Excuse me while I pick my jaw up off the floor!..this is so pretty I can't even express myself.....what have I been missing.Been on a blog break,but quickly getting back to it!Love,Love,Love all this crystal,I love crystal anywhoo,WISHLIST IS GROWING AGAIN! Bill, your posts are always such a delight. I enjoy your knowledge of the pieces you use, the stunning way you combine old with new and your amazing photography. I just love the way you played with the light in these photos. Gorgeous! P.S. You may have had slim pickings in the garden but you turned it into a gorgeous centerpiece. That is the sign of a true talent! Again, you have posted a beautiful table! I appreciate the time and effort you put into the lovely tables you share with us! I love crystal and this is super! I also love the silverware you purchased from ebay...very delicate! Thank you so much for educating me too! Have a great week! Hi Bill, Wow, what a wonderful collection of Cape Cod, stunning altogether! Love the pretty flowers and the whole setting is just beautiful. Such an elegant and stunning tablescape. I like both settings. Oh Bill, your flower arrangements are always beautiful. You do wonders with the pickings from your garden. The lighting, the crystal, the china, oh everything on the table - you took such beautiful pics. Your tables are just too beautiful too describe. I adore your magnificent collection of silver, glass and porcelain! Your tablescapes are a masterly combination of good taste and creative ideas. I love your post because I learn a lot about american dining culture which is sometimes very different from the european one. Bill, I am positively drooling with envy! Those crystal pieces are too wonderful and both tables are gorgeous. I have never seen a table set with so many stunning pieces of crystal. Just beautiful. Bill, this sparkling crystal is just gorgeous! Beautiful photography as well! Love the flowers, is that honeysuckle? It seems it is a little time that I visited your gorgeous blog. As always, I am not disappointed. What a perfect host you must be, Bill. All is exquisite.